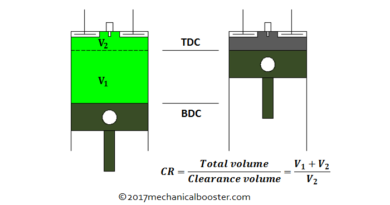 “Mechanical components shows wear and tear” this theory wakes up an engineer’s mind and forces him to innovate more to achieve an ideal system ,Since the moving mechanical components cause wear and tear which we count as a limitation of the component ,So the questions arise, Can we avoid the use of distributor in an ignition system? If yes, than how can we manage the timing of the spark in multiple cylinder engines? Let’s just find out. Distributorless Ignition System (DIS) is the ignition system in which the distributor of the electronic ignition system is replaced with number of induction coils i.e. one coil per cylinder or one coil for pair of cylinders, and the timing of the spark is controlled by an Ignition control unit (ICU) and the Engine control unit (ECU), which makes this system more efficient and accurate. 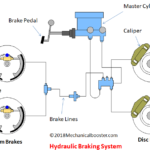 Due to the use of multiple ignition coils which provides direct voltage to the spark plugs this system is also known as Direct Ignition System (DIS). Why Do We Need Distributorless Ignition System? 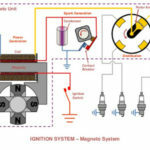 (i) Electronic ignition system uses distributor which is used to distribute the high voltage signal from the ignition module to the spark plugs, the distributor used is a mechanical device having a rotor that completes the circuit and also controls the spark timing, which make this system little less efficient and this system also faces mechanical and electrical wear and tear. 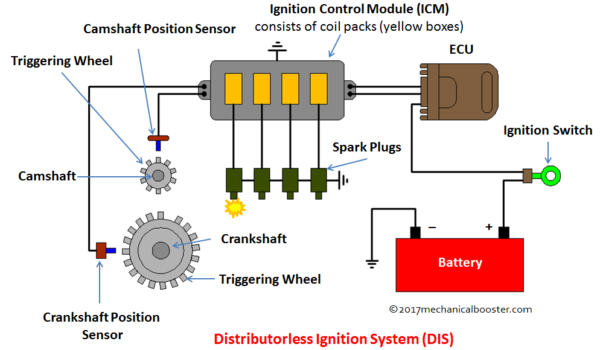 (ii) Electronic ignition system requires higher maintenance than Distributorless ignition system i.e. service period for electronic ignition system is 25000 miles and that of distributorless ignition system is 100000 miles. (iii) Distributor in electronic ignition system requires periodic check for the distributor’s point gap as they are subjected to wear and tear. (iv) The spark timing accuracy of the electronic ignition system decreases with time. 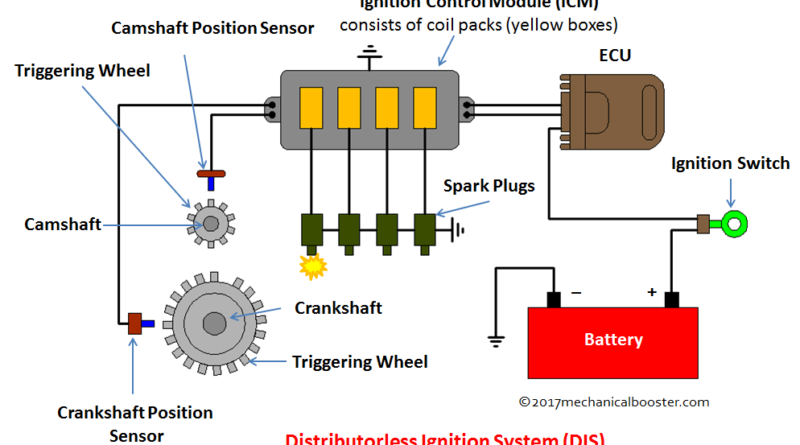 These problem gave rise to the development of a smart ignition system named Distributorless ignition system in which the spark time accuracy is increased using a electronic control unit along with ignition module and the distribution of the voltage signal to the spark plugs is made direct using multiple ignition coils, which decreases the wear and tear of the system and makes the system the most efficient and reliable ignition system till date. 1. 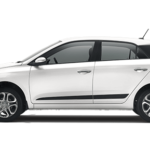 Battery: Same as the electronic ignition system, battery is used as the power house for the DIS. 2. Ignition Switch: It governs the ON and OFF of the ignition system, same as the electronic ignition system. 3. In Distributorless ignition system a complete assembly of ignition coils and module is used to make the system compact and less complicated. 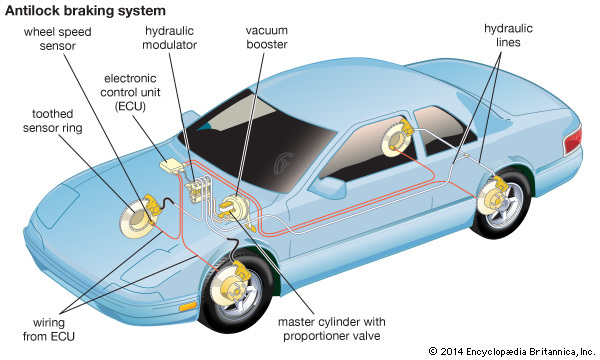 (i) Ignition Coils: Unlike electronic ignition system in which single ignition coil is used to generate high voltage ,DIS uses number of ignition coils i.e. each coil per spark plug which generate high voltage individually for each spark plug. (i) Camshaft Triggering Device: Mounted on the camshaft and used for sensing valve timing. (ii) Crankshaft Triggering Device: Mounted on the crank shaft and used for sensing the piston position or stroke. 5. Spark Plug: It is used to generate spark inside the cylinder. (i) When the ignition switch is turned ON, the current from the battery stats to flow through the ignition switch to the electric control unit (which keeps on processing data and calculating timing) of the vehicle which is connected to the ignition module and coils assembly,(which makes and breaks the circuit). (ii) The triggering wheels mounted on the camshaft and crankshaft have equally spaced teethes with one gap, and the position sensors which consists of the magnetic coil that constantly generates magnetic field as the camshaft and crankshaft rotates. (iii) When these gaps come in front of the positioning sensors, fluctuation in the magnetic field occurs and the signals of both the sensors are sent to the ignition module which in turn senses the signals and the current stops to flow in the primary winding of the coils .and when these gaps go away from the sensors the signals of both the sensors are sent to the ignition module which turns ON the current to flow in the primary winding of the coils. (iv) This continuous make and break of the signals generate magnetic field in the coils which in turn induced EMF in the secondary winding of the coils and increases the voltage up to 70000 volts. (v) This high voltage is then sent to the spark plugs and the generation of sparks takes place. 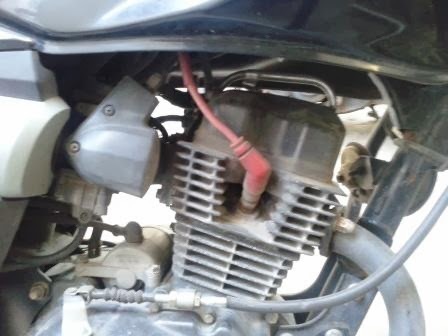 (vi) The timing of the spark plugs is controlled by electronic control unit by continuously processing the data received from the ignition control module. (i) Distributorless ignition system (DIS) is being used from a decade now so almost all the cars with 1.8 L, 2.8 L VR6 AND 2.8 L V-6 engine on the road uses this system. (ii) DIS is first used in 2.8 L VR6 engine equipped Volkswagen Passat. (iii) Some high end bikes like Ducati super sports also adopt this system. 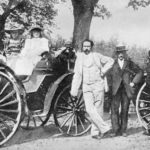 If you find this article informative than don’t forget to like and share. 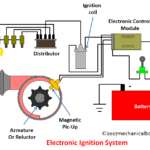 ← How Electronic Ignition System Works?